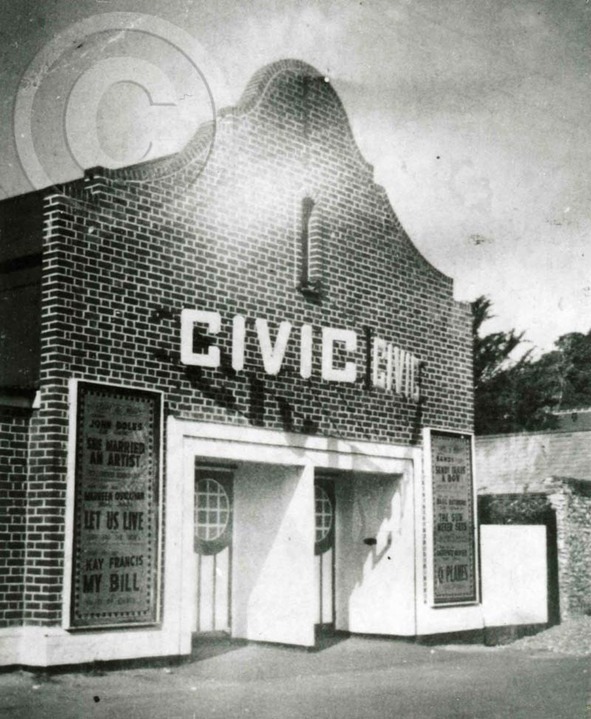 Richard Zealey of Basingstoke has sent in his recollections of the history of the Civic Cinema in Alresford, which operated from 1937, through to the late 1960s. A summary of this history is as follows. 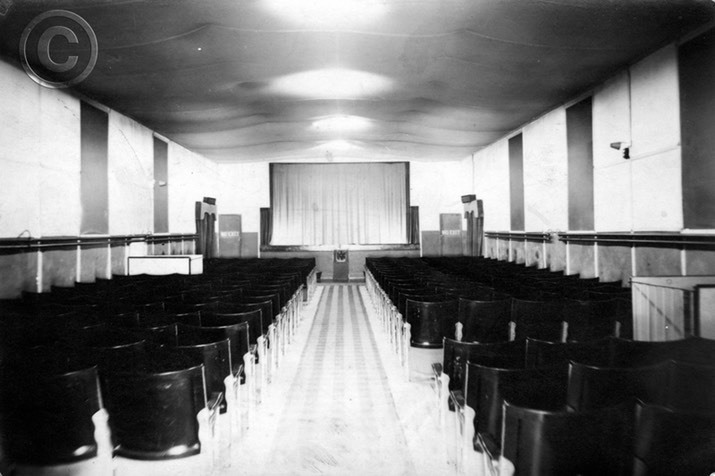 In the 1930s, two young men, well, men in their 30s, who had studied together at Harrow County Grammar School, formed a company called Summit Cinemas Ltd, with the intention of setting up a cinema. They enlisted the help of one of their former teachers at this school, Percy Rayner, who was then the Headmaster of Pinner County School, in Middlesex, to be the third Director and investor in the company. The two ex-schoolboys were William Zealey, Richard’s father, who was a carpentry contractor working mainly on private houses, and Keith Wilson, who had set up Soundcraft Ltd of Kingsbury in Middlesex, who had also become the District Commissioner for Scouts in South Harrow. Why they chose to establish their first cinema in Alresford is unknown, but they leased a building on Station Road from Mrs Hankin, who owned the garage on West Street. The building was of corrugated iron construction, but they employed Mr Budd of Ropley to build a brick area at the front to accommodate the Box Office, toilets and a store: the operating room for the film projectors was above these rooms, accessed by an external iron staircase. Since all the Directors were living around Harrow, they appointed a manager to run the cinema: Richard thinks the first was called Yardley. Later they had a Gordon Wigg as manager, whose brother became Lord George Wigg, after being an MP. Gordon at first lived in Basingstoke, but then took over as landlord of the Volunteer Arms, in West Street (where the dress shop, Moda Rosa, is now located): his wife ran the pub while he dealt with the cinema. Films were changed three times a week, so his job also involved collecting and delivering the films to a garage in Basingstoke, and then later to another garage on the Winchester bypass. In these days, life was simpler, so despite the garages not staying open in the evenings, the films would be left on the forecourt, presumably under cover, by the delivery driver, and Gordon Wigg would collect them later when he arrived. The films were returned in the same way. Few other people would have any use for such film, so the public exchange was relatively secure. Richard Zealey stayed at the Volunteer Arms when he was in his teens, in 1943. He remembers that the Army had taken over the rear of the premises, to do boot repairs. 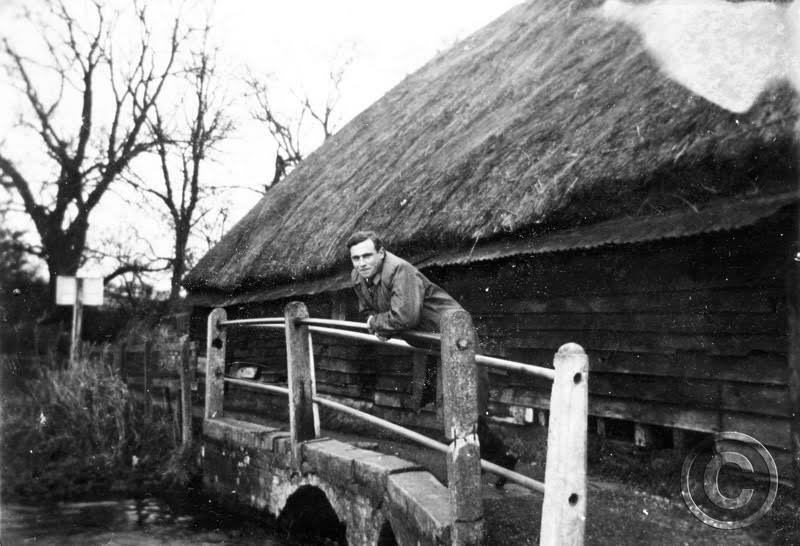 Richard also swam in the river, by Fulling Mill, which at that time was much dilapidated. He and his father would have tea in the tea room in East Street that he thinks was called the Blue Café: they were served by Katie, who always referred to the owner as “Madam”. This maybe reflects the whole background of the Blue Café, which was an old-fashioned tea room, run by two elderly ladies. Richard also came back to Alresford in 1964, and was once again served by Katie, now working in a café in Broad Street! Gordon Wigg ceased to be the cinema manager later in the 1940s, to go to be a landlord of a pub in Fourmarks: the next manager was Alf White, who worked in the Post Office in Alresford. Alf White ran the cinema with help from his wife Betty: more of their life and work in Alresford can be read in article by Brian Rothwell in Alresford Articles Issue 5 (2015), from the Alresford Historical and Literary Society. Richard does not comment on the cinema history after the 1940s. Other reports have been recorded in earlier stories on the Alresford Memories website: the ones that follow are from Audrey Chalk, Pam Bailey, Pat Bentley and Gladys Ashe. They described the building as an un-insulated tin shack, an oven in Summer and a fridge in winter: there were two stoves for use in winter, which roasted those close to a stove – but everyone else was chilly. Audrey Chalk was the usherette in the cinema, when the normal usherette (who happened to be her future husband Pete’s Aunt, Kathleen Smith) was on holiday, or absent. 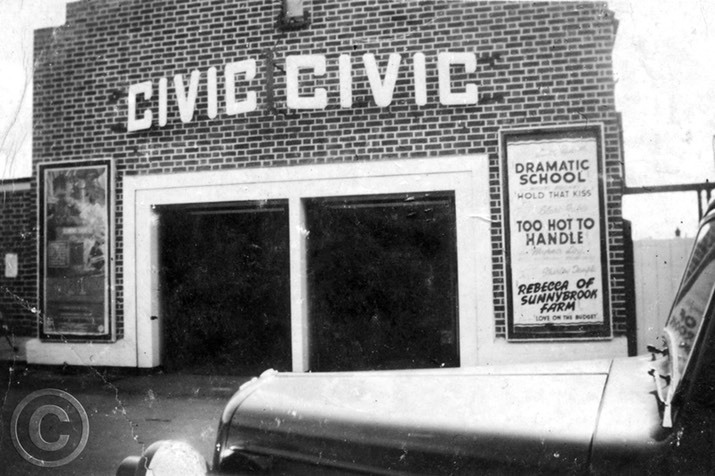 At first the photo above was thought to have been taken in 1938, soon after the cinema opened, but Richard Zealey has commented that the car has a hooded nearside headlamp: this only happened during WW2, when normally the offside light would have been switched off, and the nearside lamp would be hooded as shown in the picture. So maybe this photograph dates from later, say in 1940. The films advertised were available in both years! Pat Bentley also helped as a projectionist at the cinema, and because of his liking for Rock & Roll discovered that the large speakers behind the screen were very effective for playing his 78rpm records. The regular projectionist was Georgie Troke, sometimes helped by Pam Bailey’s brother. Pam recalls the audience stamping their feet when the film projection broke down. Entrance charges were three old pence for seats at the front, and six pence at the back: there were three films per week, one of which was a matinée. Gladys Ashe remembers the matinee performances for children on a Saturday, which also cost three old pence per person. Gladys went there as a birthday present, and saw her first film – which was Shirley Temple in “Heidi”. She also got a badge for this! All the photos included above are reproduced here with permission from the copyright owner, http://www.alresfordheritage.co.uk, where many other similar old photographs of Alresford can be found.